Has the Olympics Games become too big and too expensive? An important debate about the future of the Olympic Games has been taking place here in Sochi. Given the jaw-dropping scale of Russia's first Winter Olympics - the most expensive in history - it is perhaps the perfect place to consider whether the movement is heading in the right direction. 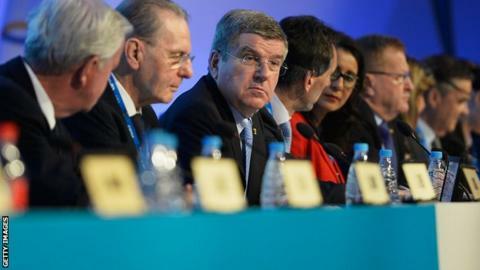 Over the course of the IOC's two-day session on the Black Sea coast, members have been invited by the organisation's thrusting new President Thomas Bach to submit their thoughts on the future. It's all part of the Agenda 2020 programme which helped get him elected in Buenos Aires last September. Following the first day of discussions, there were 166 contributions from 68 of the 102 members in Sochi. Even Britain's normally reticent Royal IOC member, Princess Anne made an intervention. The scope of the debate is ambitious. The time frame for drawing up meaningful changes even more so. Working groups will take forward any suggestions, before an extraordinary session in Monaco in December will vote on which reforms to introduce. So what are the big challenges facing the IOC? Sochi's £31billion Olympics might be a one-off designed to enhance Vladimir Putin's standing on the world stage but it has exposed the IOC's anxieties about the largesse of the Games. Bach is concerned that the cost of staging the Games, as well as the IOC's bidding requirements, is discouraging cities from bidding. Both Munich and Stockholm have pulled out of the race for the 2022 event while Rome withdrew from the 2020 summer contest because of the state of the Italian economy. On Wednesday, some members raised the prospect of whole countries rather than cities hosting the Games. But this idea met resistance from those who believe the unity of the single city gives the Games its unique character. In any case, hosting the Games across a whole country rather than in one city doesn't answer the fundamental issue of scale. If anything it might encourage even more expense and largesse. What Bach and the IOC must wrestle with is how to make the Games more compact and less expensive to host but also keep all the sports who want to be part of the Olympic programme happy. Some believe the Games should be more flexible in terms of the sports included in the programme and the duration of the event. As one senior IOC member put it, there is no real reason why the Olympics could not be made longer. And yet that would surely lead to greater pressures to expand the Games - putting it at odds with the need to make them less difficult and expensive to stage. Then there is the question of the bidding process itself. Bach believes it is too cumbersome and prescriptive and wants to make it easier for cities to bid. But members remain obsessed with restoring visits to candidate cities - scrapped after the Salt Lake scandal. Members say it would allow them to make a more informed decision but restoring visits runs the risk of making the bidding process more complicated and looks like a backward step. On Thursday, there will also be a discussion about setting an upper age limit for members. Judging by the number of points made by younger athlete representatives on Wednesday it is clear that this could lead to more radical thinking by the IOC. But for all the talk and debate, the men and women who run the Olympic movement are ultimately a deeply conservative bunch and Bach's soft revolution is unlikely to lead to too many fundamental changes. London's successful hosting of the 2012 Games has given the IOC a lot of confidence for the future. Sochi poses many problems but if these Games pass without any major hitches, then Bach may find it harder to argue for major reforms.